S.T.A.L.K.E.R. 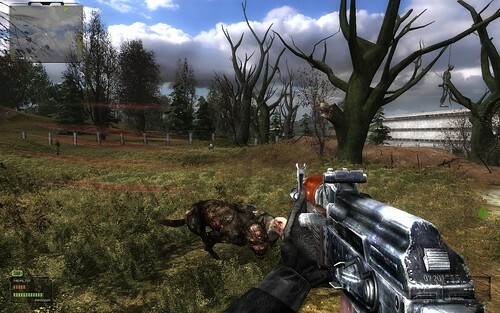 Complete 2009 is a super-mod, combining a ton of existing mods, ironing out incompatibilities along the way - with the goal of bringing STALKER "up-to-date". 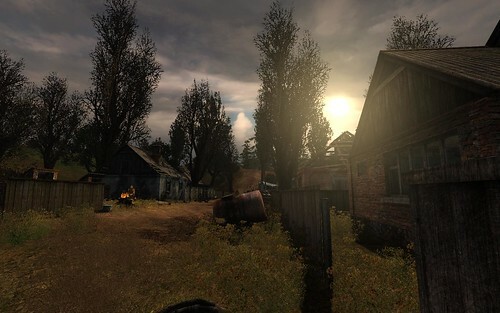 This mod has been created with a thought of bringing the beautiful and immersive game of STALKER from the last generation era, when it was created to an up-to-date experience you'd expect from games you play in 2009. These are meant to technically and artistically enhance the game without compromising the original feel and atmosphere developers meant you to see. You'll notice every single detail has been retouched and has a polished feel to it. It's a significant set of graphical upgrades paired with some bug fixes and only minor retouching of the core gameplay. It's billed as "vanilla 2.0", an attempt at making a better "vanilla" STALKER experience rather than trying to alter the game. I never played more than an hour of plain-jane STALKER, so I can't speak to gameplay changes. But the graphical changes are immediately smack-you-in-the-face obvious. It's stunning. Whereas looking at old STALKER made me think of, well, a 2007 eastern European PC title, the texture and shader upgrades in STALKER Complete 2009 made the place instantly come alive. Minimum: 8800GT 512MB or equivalent. Recommended: GTX 260/275/280 1GB or equivalent. I think they're shooting high, as my GTX 260 runs everything cranked fully perfectly smooth (~60fps). At least in the gameplay area from the intro through the first mission. * Pay attention to the mod's installation instructions, there's a change in the "user.ltx" and "fsgame.ltx" files you'll want/need to make. Just a couple of quick text edits. * If you have the Steam version of STALKER, you will have a "user.ltx" file in your STALKER steamapps' "_appdata_" folder that does absolutely nothing. Find the other one. In XP, it's at "C:/Documents and Settings\All Users\Documents\stalker-shoc\user.ltx". In Vista/Win7, just use the search for "stalker-shoc" and you'll find it. * On my machine, in Vista 64, STALKER would crash with this mod. It also crashed with a few individual mods, so I can't say for sure what the problem is (yes, I did do the "3GB enabler" EXE patch in Vista). On XP on the same machine, it's running beautifully. Looks like it's time to reinstall STALKER. Well, until it runs on Vista 64 I'll continue to play the regular version (about 3 hours in). Damn shame. For the record, installing mods with STALKER is easy: the ZIP archives contain a "gamedata" folder, which isn't part of vanilla STALKER. Extract the "gamedata" folder into the STALKER directory, and you make a change to a text file to tell STALKER to look for the "gamedata" folder (basically, you change a "false" to a "true"). Deleting mods is as simple as removing that "gamedata" folder and changing that "true" back to "false". It may run perfectly fine for you in Vista 64. Other people are running it in Vista 64. I have been unable to do so, but that experience has not been shared by all Vista 64 users. And since I had problems with mods in general in Vista 64, it would appear to not be related to this mod specifically. It's easy enough to try. Like I said in the last post, if it doesn't work for you, you delete the "gamedata" folder and reset that one config text file change, and you're back to vanilla. Can you install the gameplay-related mods without the visual upgrades? I don't want to stress my 7600 and it sounds as it would not run smoothly enough unless you have a more current gpu. Ooh. I'm going to have to try this. I have an 8600 GT, not an 8800, but maybe I can just sneak in under the wire. Is this one of the mods that has drivable vehicles? Sadly, no. Oblivion Lost has that, though. Alrighty I'll give it a shot! Not with this pack, but if you go to the webpage, it lists every mod it contains and what they do. So you can use it as a reference to hit Google and grab the stuff you want. If you have performance problems, delete the "shaders" folder from the "gamedata" folder (which will remove just the shader mod, which is the primary performance hog) and go download and install Float32. Float32's homepage appears to have died, so when I get home, I'll upload the latest Float32 to my webspace and post a link, for anyone who wants it. I had to go digging to find it when I went looking for it. I have Float32 from my last playthru of the game so that's no biggie. I'd uninstalled the game but it should be on my archive HD. I can upload it too for anyone who needs it. I have had no problems playing any of the Stalkers on Vista 64. Thanks Legion I will check this out. I am always looking for an excuse to replay this. OK, I just threw Float32 up on my web space. Dunno if this is the latest version or not but here it is. Clever! Thanks for sharing the mod. This would be my third playthrough SoC. Whatever, better this than....any other single player game. Looks like this has some nice minor gameplay tweaks, which I can live with. I am not a big fan of the big game overhaul type mods that changed things so much, most modders, while skilled, are not very good game designers. First time though I just used Float32 and the no head-bob mod. Weapon repair and the option to sleep sound pretty handy as well though. And the Freeplay mod sounds awesome. If only I hadn't lost my savegames in a crash. The no head-bob is pretty much an essential mod. I can't imagine why any fps developer thinks that head bobbing is a good thing. Agreed. The Zone Reclamation Project mod (which is part of STALKER Complete) removes head bobbing, and is the source of a lot of STALKER Complete's bugfixes/game tweaks. For the people installing mods piecemeal for performance purposes, that's one you definitely want to get. Nevermind reinstalling. I passed STALKER by during its prime, and now is the time to see what this game is all about. 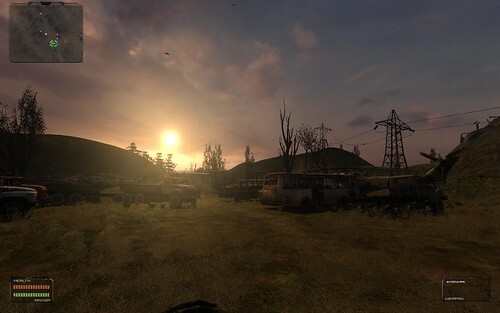 RPS had a good article on recent mods of Stalker and Clear Sky over here http://www.rockpapershotgun.com/2009/04/27/stalker-the-mods-return-to-clear-sky/. 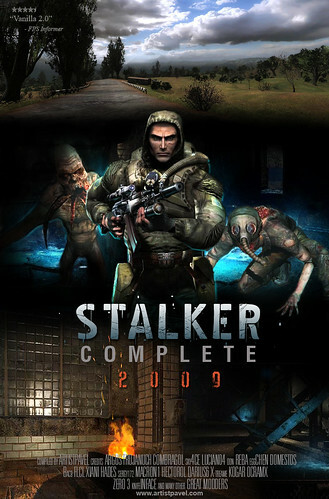 Wish there was a version of Stalker Complete for Clear Sky. Never really managed to get into that one and have been meaning to get back to it for some time. Just installed and runs fine on my Vista 64 machine. Definitely looks cleaner and brighter, but I'm not seeing a massive improvement to warrant a GTX260 recommendation. Really like the UI improvements though. Good enough to start my game over, for sure. Runs great on my "Workstation 2008" (vista 64 essentially) system. Graphics look nice but Its hard for me to tell how improved it is without a side by side comparison. I think Im going to finish the game this time! It's definitely improved, though the differences can be a bit difficult to detect in indoor areas. My rig chugs a little bit at times with the settings all cranked up (OCed 4870 1GB, Q9550) so I may need to do a little settings tweaking. It seems like it's going to be worth the trouble, though. Did they get rid of "Don't just stand there Stalker, come in!" guy? Because if so that change alone would be worth the install. Damn, I fall into the camp of Crashes on my 64bit Vista build. Was looking forward to finally getting into this game too. The 1.2 version of the mod has been released, updating and incorporating a few new mods to the pack. The way the game world looks as it gets to dusk and nightfall makes me want to curl up fetal-style in the "safe" area and never go out. Still no multiplayer coop? Still no interest.